I’ve recently been working on a number of animal pieces in coloured pencil. 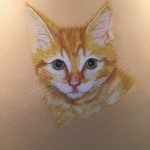 As part of doing this, I’ve been experimenting with some different papers and have found I really like working on Pastelmat which has a velvet like surface and is great for laying down multiple colours when depicting fur. 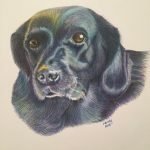 Wilf was one of the first pieces I completed on pastel mat, although the earlier picture of Lexi was the very first one. Wilf was a commissioned piece and he had the most fabulous fur and expression. The contrasts of colours were great to work on and his owner was delighted with the finished result. My next piece was one of my own pets. Meet Buster the cat. Buster is a mature 11 year old now but I chose to draw him when he was a tiny kitten and had just come to live with us. I think his marmalade tabby markings work really well on the colour of the pastel mat. 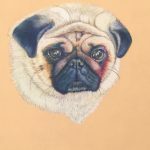 My next piece was a gift for my sister in law and is a drawing of her pug Coco. I loved the colours I was able to work in around her muzzle and I think her eyes are particularly expressive. And this is my very latest drawing. This time, it’s not on pastel mat but Bristol Board Extra Smooth. 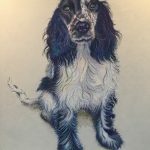 It was much more difficult to lay down lots of colours as the paper has no tooth, however it does a good job of helping to show the sheen of India’s coat. My next challenge is to get much better at photographing my drawings. I have a decent camera but am very likely to snap a pic with my phone and the resulting images are just not good enough. I’ll need lights and a tripod for that.